The pictures above go top left, top right, bottom left, bottom right. (You knew that didn't you). This is the cozy window seat I built for sweet Emma. 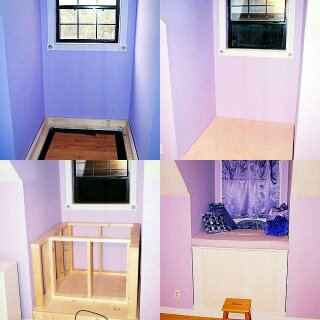 She chose a lavender for her room and the varying colors above are all the same paint, just at different light situations. With the lights off during the day, and the light filtered through purple curtains, this room glows with a soothing purple aura. The top is 4 x 4, so there's 16 square feet of lounging area atop the cushion my wife made. A few pillows and it's pretty cozy up there. The window offers a view of the "yard" (woods) down to the pond. I designed it with a lift top under the cushion for bulk storage of blankets, etc. For the front, I bought an inexpensive white kitchen cabinet, (Millspride) and set it into the frame so there is cabinet storage also for Emma's girly stuff. It's a little hard to distinguish the cabinet doors in the final photo, because we did not pick out knobs yet. We are letting them pick their own room colors as we remodel. It's only paint, so we are giving advice, but letting them decide. Em has always loved purple. As a tiny thing, she had a dolly named, Emily Purpley and though the doll is gone, her love of purple has remained. She and her mom did the painting in this room. I did the tear down, new flooring, trim, and carpentry like the window seat. They also did the custom cushion cover, etc for the seat top. nice work. kudos to all. i like the way the same wall color looks different in various lightings. Thank you. I think that really blue tint is something from the computer...I haven't actually seen it look that bluish in real life. Thanks again. What a handy dad, and what a great room. Tell Emma that when I put my office under the stairs together I was harking back to my younger years too. Something nice and cozy. What is it about a small cozy space? It must be genetic memory of the den. Current trends are for huge mini-mansions, but give me the hobbity house any day! Nice work! Can't go wrong with Purple and White, Kansas State University colors!